This article was originally published on February 1, 2019 and expired on April 15, 2019. It is provided here for archival purposes and may contain dated information. Roby-Vorgias succeeds Sandra I. Davis, who retired in January with 48 years of service in Extension. As County Director, she will lead the tri-county unit and its 20-plus staff members in three office locations – St. Charles, Naperville and Yorkville. She also will be responsible for personnel, financial, program, and facilities management. Roby-Vorgias has a master’s degree in Education - Human Resource Development from University of Illinois and a bachelor’s degree in Corporate and Organizational Communications - Business Administration from Northern Illinois University. 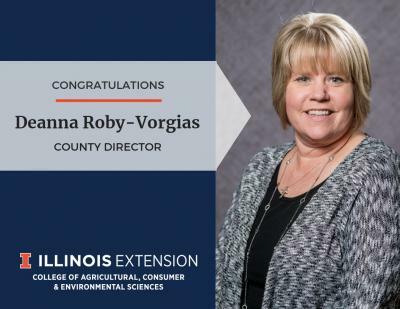 She comes to the role with 25 years of experience with University of Illinois Extension and 4-H Youth Development, most of which has been in DuPage, Kane and Kendall Counties. In 2018, she earned the state Mentoring Extension Excellence Award.